Tigers are endangered species and not just in the natural world. With the collapse of the global speculative bubble, the Walt Disney world of the Celtic Tiger has come crashing down. Ireland is obviously not alone and this crisis is global. In fact, as we have said many times the crisis of this cycle of accumulation has been with us since the beginning of the 1970s [signalled by the US devaluation of the dollar thus ending the Bretton Woods agreement on which the post war boom was based]. Since then though, different capitalist policies have been attempted to try to mitigate the crisis, without provoking a general rising of the world working class. The global speculative bubble based on unsustainable lending which burst in 2007 was only the latest twist in the tale. In Ireland, a country impoverished by centuries of British imperialism, the main commodities for export until recently were its animals and, a long way in front of them, the labour power of its citizens (or rather ex-citizens). That was until financialisation of the global economy and the low level of wages (despite a wealth of skills in the workforce) in a country already inside the European Union made the country a favoured destination for international financial capital. And with a government willing to roll over for international capital, the added sweetener of the lowest corporation tax in Europe (12.5%) ensured a continuing capital inflow since the last Irish debt crisis of the 1980s. Basically Ireland’s fantasy growth since 1988 has been based on the speculative financial bubble all over the world. In the local economy this took the form of a massive homegrown property speculation fuelled by cheap credit (as Eurozone interest rates were low). The price of the average house soared by 350% between 1997 and 2006. When the international speculative bubble burst, as in other places, it not only ended the property boom but also exposed the dodgy practices of the Irish banks. And even in the terms of the greedy, short-sighted world of finance, Ireland’s banks take some beating. Money was lent to property speculators who bought up every bit of brownfield and greenfield site they could. It turned Irish land into the most expensive in Europe. But the property market collapsed when the bubble burst leaving the property speculators holding “assets” they could not sell bought with loans they could not repay. Today there are over 620 “ghost” housing estates, occupied by no-one, dotted around the Irish countryside. The banks, which were hardly regulated at all, did not want to foreclose on the loans as this would trigger their own bankruptcy but as they have so small a deposit base they can only keep functioning if they can raise money on the international money markets. When the bubble burst these funds dried up so they turned to the Fianna Fáil Government for help. The Government had existed on the tax receipts from the property boom and as quite a few of the political class had their own ties to property speculation they were naturally sympathetic to the bank’s appeal. As the bank bosses actually hid the full amount of the disaster waiting to happen they became partners in crime. The Government put its full weight behind the banks. It not only guaranteed “all deposits (retail, commercial, institutional and interbank), covered bonds, senior debt and dated subordinated debt” but also set up the National Asset Management Agency [NAMA] to buy the non-performing debts from the banks. At the time financial commentators around Europe were fulsome in their praise of the Irish Government’s prompt action. But all they had done was transfer the bank’s debts to sovereign debt. In the past such sovereign debt (i.e. issued by the Government) was regarded almost as good as gold but that was in the days before the financialisation of the world economy in the 1980s. Since then the quantity of money floating round the planet has dwarfed anything that state’s can produce via taxation etc. It eventually became clear that the Irish Government was in trouble. Not only did the value of the “assets” (bad debts to you and me) continue to fall (to about 56% of nominal value) but it gradually became clear that several banks had colluded in outright fraud to inflate their balance sheets. Instead of the €1.5 billion the Government said was needed to bail out Anglo-Irish Bank, for example, it was now predicted to be €35 billion! A few bankers caught red-handed in 2009 resigned and a few banks including Anglo-Irish were nationalised but by now the credit ratings agency were on the Irish case. All workers above minimum wage have suffered a new levy on paychecks equivalent to 4 percent to 8 percent of their gross pay. Ireland’s 350,000 public servants, who have the country’s most stable jobs and guaranteed pensions, have been hit much harder through pay cuts ranging from 5 percent to 15 percent and a pension levy equivalent to about 7.5 percent of salary. But the package only staved off a further credit rating cut until the revelations about the real state of the banks hit home. In August 2009 Ireland lost its high credit rating so its interest repayments doubled to over 6% (Germany’s is about 3% and Greece’s around 10%). At this point the bankruptcy of the state was a real possibility despite the repeated denials of PM Cowen and Finance Minister Lenihan. More banks were effectively nationalised so that 4 of Ireland’s top 6 financial institutions (and their debts) were now under the control of the state but this still did not stop the credit rating of the Government declining further (by mid November 2010 it had to offer 9% in the bond market). With bank shares also in freefall in mid-November 2010 Lenihan and Cowen had to admit the game was up. Ireland was effectively bust. The IMF was already waiting but so too was the ECB, and the European Commission. The bailout package was eventually fixed at €85 billion (but the cost of fixing Anglo-Irish alone is fixed at more than €35 billion). This will be available at around 5.7% which is a lot less than the money markets will give but double what Germany pays. In fact most commentators think Ireland could have got better terms if it had not been for the intervention of Chancellor Angela Merkel whose insistence that bondholders should take “a haircut” panicked the markets into raising Irish interest rates before the deal was signed. The price is high. The Irish Government has to find savings of €15 billion over the next four years to bring its budget deficit down below 3% of national income (it is currently 32%). In addition €17 billion of the €85 billion will come from the Irish state pension fund itself thus begging the question of further pension cuts further down the line. As a freezing rain fell on Dublin, the Irish government unveiled the most brutal step yet in its austerity drive: a budget of unprecedented severity that will save €6bn (£5bn) through drastic spending cuts and tax rises for hundreds of thousands of people… Among the most painful measures announced were cutbacks of around five per cent in social welfare benefits, including child benefit. Jobseekers allowance will also be reduced. Many more workers will be brought into the tax net while various other taxes and levies are to be raised. As a gesture to angry public opinion, the government announced salary cuts for the Prime Minister, ministers and others in the public sector, where salaries from now on must not exceed €250,000. In addition the retirement age will be raised to 68 by 2014. Ireland’s minimum wage will be cut by 13 percent and all households face a new £257 a year property tax. Some 25,000 public sector workers will lose their jobs. VAT is to go up to 23% by 2014. But it is clear that “public opinion” in the face of these and previous cuts has not been “angry” enough. Workers in other European countries with financial troubles are striking or rioting at the mere announcement that cutbacks are needed to dig out of the government debt crisis engulfing the continent. But the Irish are doubling down with more austerity. Some resistance has taken place. 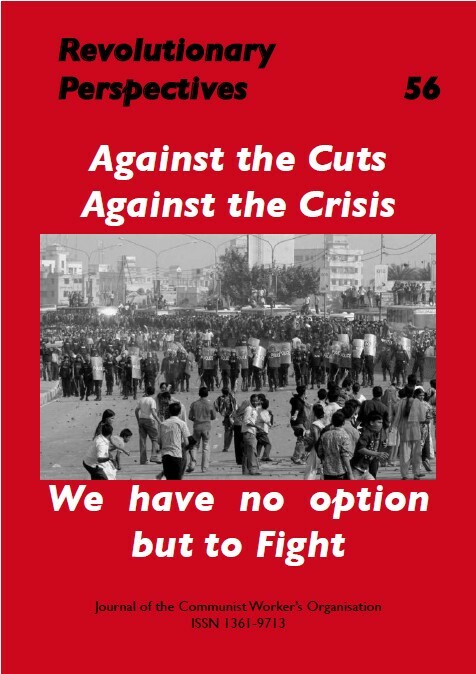 Back in February 2009, over 150,000 participated in a march against the first wave of cuts under the union slogan, ‘For a Better, Fairer Way.’ On 24th November 2009 an impressive quarter of million public sector workers went on strike. Unfortunately it was not an all out strike (it lasted one day). The famous Waterford Crystal company was also occupied in March 2009 when 480 redundancies were announced. After 8 weeks a private equity company took over the firm and 176 were reemployed whilst 800 workers shared a redundancy pot. All the sacked workers lost their pension rights. All over Ireland 8000 small businesses (mainly in construction) have gone bust in the last year. Unemployment is at 14% and rising. This means that almost half a million people are on the dole and the main alternative is the traditional one of emigration. After the announcement of the latest cuts, a hundred thousand marched in Dublin on November 27 to demonstrate their opposition. This is a magnificent turn out in such a small country, but it is going to need more than a few union-led marches to turn this one round, especially when the unions are part of the problem. These are the same unions who have preached “social partnership” with the government for over two decades. They only organise these formal protests, with their sterile marches from A to B, rounded off by tedious speeches, to give workers a chance to let off steam. Ireland’s 2 million workers - a third of them unionized, mostly state employees - have mounted few protests. Since 1987, Ireland has negotiated national wage-pact agreements designed to promote gradual raises and minimize strikes. As new income taxes slash salaries, union leaders have preferred to keep talking with the government and the major employers group, the Irish Business and Employers Confederation, in hopes of softening the blows rather than preventing them. In the so-called boom years the ICTU urged workers to accept moderate wage claims in the “national interest”. Even after the first wave of cuts the union leaderships did not change their tune. 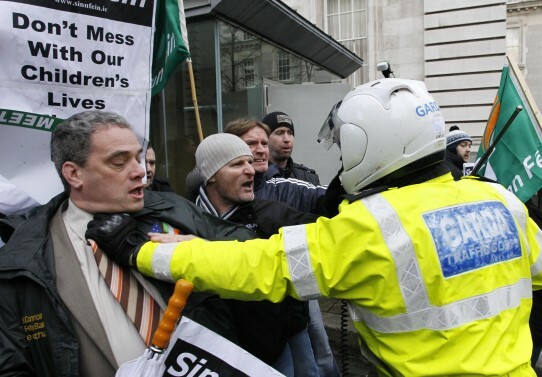 As late as May Day 2010 Jack O’Connor, general secretary of Ireland’s SIPTU public sector union, demanded his members accept the four-year strike ban, pay freeze, massive redundancies and rationalisations agreed by the unions in March. He went to add that this was “the most serious problem that has confronted this country since the Second World War in terms of its capacity to compromise our economic sovereignty and independence.” And if this sounds like Governmentspeak he went even further along the nationalist agenda by insisting the problem was one of Irish sovereignity. A modern developed EU country and participant in the eurozone is negotiating the surrender of its economic independence to the IMF. And his final argument for accepting the unacceptable was that the Government would have to make even more vicious attacks if the workers did not accept what the unions had already negotiated. Make no mistake about it, the government will come back for more, he said. Well the workers have accepted austerity plan mark one and it still did not stop the Government coming back for more. What will Mr O’Connor be advising this time? On November 27 other union leaders got on the platform to announce that now that they “will not stand idly by” but their past inactivity leaves them with little credibility today. Even now they are not arguing that the system stinks or even that the innocent should not pay for the crisis but that the Irish Government’s Four Year Plan “will do irreparable damage” to the Republic. As if it was “our” Republic and not that of the capitalist class. But then the real union agenda is to get the Labour Party elected in January, so they can carry on negotiating the same cuts against the working class (albeit over a longer time frame). All these ideological tricks are to take the focus away from the fact that capitalism throughout the world is faced with a deep and devastating crisis. It can only “solve” it by further increasing exploitation and misery. There is not an Irish or a Greek or a Portuguese crisis but a crisis of accumulation of the whole system. What the experience of Ireland lays bare is that in order for the capitalist class to restart their speculative games, the working class will have to pay the price of the bailout of the system, and they will have to pay for years ahead. All kinds of agendas will be pursued by various capitalist interests in order to divert workers’ attention from this one solid fact. Already the nationalist card is being played by the unions. The fact that the November 27 march ended at the Post Office in Dublin was intended to rekindle the nationalist myths of Easter 1916. The enemy will not be the capitalist class everywhere but the IMF or the EU. The same message was hammered home in the Irish Times which asked in an editorial “Was it for this?” that Ireland’s revolutionary heroes had died fighting in order to get “a bailout from the German Chancellor with a few shillings of sympathy from the British Chancellor on the side”. This pathetic recourse to nationalism is almost comical but the ruling class will seriously wrap themselves in the tricolour in the months ahead. We already have the distraction of a general election looming in the new year. The politicians of all stripes will ensure that, instead of fighting for their living conditions, Irish workers will be speculating about who will cut their throats in the gentlest fashion. Already the nationalist handwringing has benefitted Sinn Fein. They hope to follow up their success in taking the Donegal South West seat from Fianna Fáil to make a real breakthrough in the Dáil. A nationalist and populist agenda is just their kind of mix but the Labour Party is also not far behind. Some of its leading lights are even calling for Ireland to do an Argentina and default on the loans. Fine Gael, the main opposition party are expected to lead any new government but they have more or less accepted that the budget will have to stand so may not be as successful as the pundits are predicting. In all cases though, the debate is about scapegoats, whether bankers, politicians, the IMF or Angela Merkel. It is not about the bankruptcy of the global capitalist system. In France, in Italy, in Spain and in other countries (see articles in this issue) workers are facing the same attacks as in Ireland. Increasingly they are looking to themselves to mount a real resistance to the misery which capitalism has in store for us. They are putting their trust not in unions or politicians to do things for them. They are beginning to form their own organisations which unite and coordinate the fightback. These are as yet embryonic but they are a start. The experience of Ireland though demonstrates the opposite. Acceptance of sacrifices for the “good of the country” means only one thing - more sacrifice will be demanded. The capitalists everywhere are trembling at the prospect of social unrest and so far cannot believe their good fortune that they have got away with it. But the consequences of these cuts have so far not really been fully felt. When they are even the hitherto compliant working class in Ireland may join with workers elsewhere in rejecting what capitalism is preparing for us.